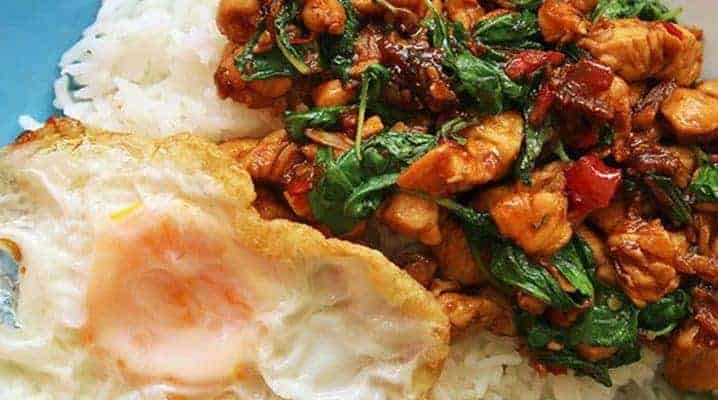 Thai Holy Basil Chicken (Pad Kra Pao Gai, also known as Gai Pad Krapow) is a Thai Hawker Stall / Street food. A well known favorite, the dish has gained immense popularity, not just in Thailand,but around the world. Bite sized diced chicken (often ground chicken) is stir fried with a delicious sweet salty sauce. Then toss the Thai Holy Basil into the wok at the very last minute. It is this addition of Holy Basil which infuses the dish with an unmistakable aroma. Enjoy the Thai Holy Basil Chicken with a bowl of steamed jasmine rice. In addition a runny yolked fried egg complements the flavors of the dish. Add separate slivers of Thai birds eye chili for some extra spicy kick. Thankfully, this dish is so quick and easy that dinner can be on the table and in front of family in less than 20 minutes! Holy Basil is revered throughout Asia because of it’s medicinal properties and culinary uses. It is the aroma and distinct flavor that gives this dish its special character. “Kra-pow” the Thai Holy Basil, is a distinct member of the Basil Family of herbs and has a distinctive scent of clove with jagged tipped leaves. You will hear locals refer to it as “Hairy Basil”. This is because the leaves and stems of Holy Basil have very fine fuzzy hairs growing on them. Do not confuse Thai Holy Basil with the more common Thai Basil – “Horapha”. It is a very easy to do. As a result it can be quite difficult to find holy basil in Western stores. You can use the more common Thai sweet basil as a substitute. Be aware this will change the taste significantly. I prefer not to cook the dish unless I have the real thing! Chicken – Diced or Minced? You have a choice. You can have your chicken diced into small bite sized pieces or ground. I prefer the Hawker style of bite sized chicken. Many would however argue that you should use ground chicken in the recipe. It is entirely a matter of personal taste! I urge you to try both and decide for yourself. You can purchase ground chicken at most grocery stores or you can make your own. I think the best ground chicken combines both chicken breast and chicken thigh meat. To me, this dish could never be complete without that fried egg on the top. The edges are crispy. The yolk is slightly runny and therefore adds even more flavor to the dish. Enjoy this great spicy stir fry, the delicious Thai Holy Basil Chicken! Make sure to check out our other great Hawker street food dishes – Malaysian Nasi Lemak or Char Kway Teow.